Today I’m happy to announce the public alpha release of Apollo17.org, an interactive explorer that allows you to experience the entire Apollo 17 mission (305 hours long) in real-time. It represents the culmination of the years of mission data cleaning I have blogged about here. My goal is to create a full-featured site that will allow the public to explore and experience the Apollo 17 mission in this way. Version 0.1 is now active which is just a proof of concept. Currently you need a fast computer and a good internet connection to run the experience. Best viewed in Google Chrome (it hasn’t been tested with any other browsers). Jump to any point in the YouTube video, and the mission transcript will scroll automatically to that point. Click any line in the transcript and the video will jump to that instant. For big jumps, click an item in the table of contents (bottom left). 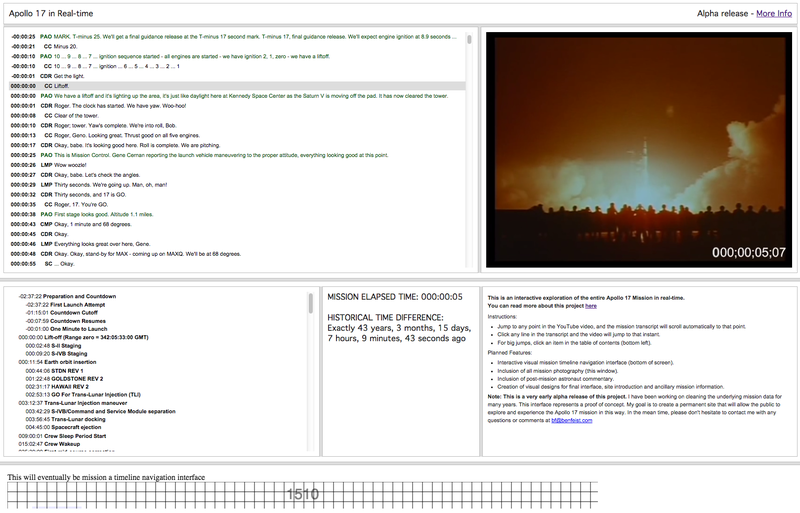 Interactive visual mission timeline navigation interface (bottom of screen). Inclusion of all mission photography (this window). Inclusion of post-mission astronaut commentary and other materials. Creation of visual designs for final interface, site introduction and ancillary mission information. I wrote a Python script that uses a simple templating engine to render out the raw mission data into various HTML files. These files are untouched output from the Python process. Any transcript corrections needed are made to the underlying mission data and the Python rendering process is rerun. This keeps the raw data as the authoritative source of the mission and keeps the interface elements separate from the mission data itself. The apollo17.org interface is written in HTML/CSS/JS. Currently the utterance window (top left) contains the rendered output of the entire mission (14MB) resulting in quite a heavy amount of processing for the browser. This isn’t a permanent solution, but once I create an interactive timeline interface at the bottom, I can revisit how the data is pulled into the browser for display. Throughout the creation of this project, the idea of “historical time” has become more and more evident to me. When the mission is played back, we’re reliving seconds that occurred some 42 years ago–to the second. I have created a “Historical Time Difference” element that shows exactly how long ago the moments experienced occurred. Pingback: Apollo17.org, detalles de la misión del Apollo17 segundo a segundo | Fravala.com - Las noticias de tecnología a tu alcance. Amazing, sir, excellent work ! I watched the whole thing (passing a few moments thanks to your brilliant interface). Thank you a lot for this experience ! At this point, the only suggestions I’d have are purely aesthetic and subjective; the black video could be fixed by a tiny animation with position of module / voyage (earth-module-lune map) (for example, like the screens on some planes), or a picture with crew/letters correspondence from script so we can put a face while they speak (I did it easily with Google, so as I said it’s purely aesthetic). Once again incredible work and extremely informative. Thank you! Thanks so much for the kind words and feedback. I couldn’t find the timing mixup you’re referring to. I couldn’t tell if you meant 51 seconds or 51 minutes into the mission. Please provide the exact mission time in the bottom right of the video. Animations for the blank parts of the video is a great idea. There’s a youtube channel that has several of these types of animations. I have it on my todo list to reach out to him to see how he creates them. I’m planning to replace CDR with “Cernan”, LMP with “Schmitt”, and CMP with “Evans”. The Capcoms will also be correctly named as they change shifts. I could make a photo appear upon rollover. I’ll take a look. I’m so glad you enjoyed it. Please let me know of any further errors you encounter or suggestions. Follow me on twitter at @benfeist for update announcements. Sir, what you did here is just phenomenal. I’m so glad you are enjoying it. Apologies to your wife! Just sent you an email. Congratulations on the phenomenal work that you’ve done. I would love to read more about how you coded the site. Your site is terrific on MacOSX Yosemite with Safari. What was the origin of the film in the video box? It looked like a good deal of it is from NASA’s Apollo 17 16mm magazines. But, that some was also from downlinked video. Is that correct? Apologies for not replying to this sooner. The origin of the video in the youtube window is a mix of onboard 16mm, television downlink, and ancillary 16mm shot in mission control.